Concrete, 2' X 3' X .75"
"My work in concrete consists of transferring charcoal original drawings onto wet concrete. The paper on which the drawings are sketched are treated with retarding chemicals. 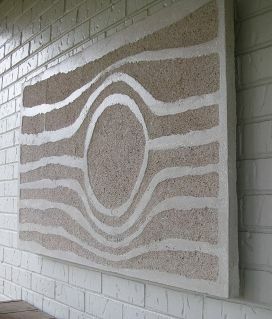 The end result is a relief which can be hung on any exterior wall exposed to the elements. Fine linework, not achievable with sculpturing tools, bring out the details in these deeply etched, 3-dimensional works." 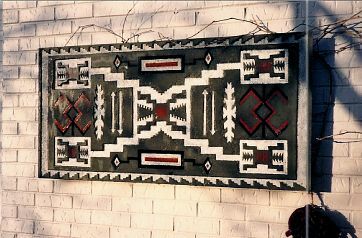 Melland's technique is to use a special retardant paper (it contains chemicals that slow down the set time of the concrete). 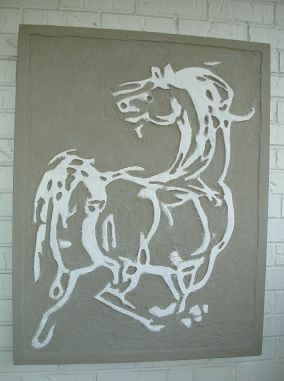 The design is drawn on the back of the paper; the paper is then cut out and placed in the bottom of a casting bed or form. The concrete is poured on top. A few days later the surface is blasted with high pressure water, which washes the unset concrete away. The concrete is then stained to highlight the relief. Back to Guest Gallery list?